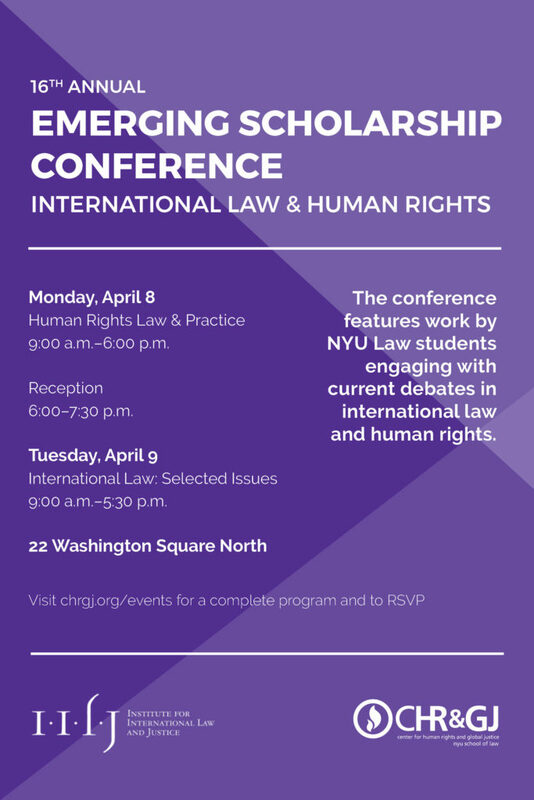 The Center for Human Rights and Global Justice and Institute for International Law and Justice‘s 16th annual In Emerging Scholarship Conference provides an opportunity for current NYU School of Law JD, LLM, and JSD students to present papers and to foster discussion and debate on a broad set of international law and human rights issues. The purpose of the conference is to encourage the development of scholarship by giving students an opportunity to present papers and works-in-progress in a constructive and collaborative environment. Selected students will briefly present their papers or works-in-progress at the conference and will receive comments from an interdisciplinary group of faculty members and leading practitioners. In addition, one student will be awarded the Center for Human Rights and Global Justice’s Emerging Scholar Essay Prize for the best paper on human rights. 5:30–7:30 PM RECEPTION All conference participants and guests are welcome.